Even while the Renault D1 was still in development, a heavier version was requested by a directive of the direction de l’infanterie from 23 January 1930. This called for a medium tank (the D1 was a light model), with 40 mm (1.57 in) of armor, that was faster (13.67 mph/22 km/h) than the D1, which in turn required a far more powerful engine. Negotiations ended in April-May, Renault also agreeing to build an adapted version for the colonies, the D3. It was also hoped that it could replace the heavy B1 bis if the later would have been banned by an armament reduction treaty in negotiation at that time. However, this never happened, and the D2 soon became a low-priority project and the army greatly reduced the initial order of 750. Two batches of 50 would eventually be delivered by the company, the first in 1936-37 (called model 1935) and the second, much improved, in 1940 (model 1938). Three prototypes were built. 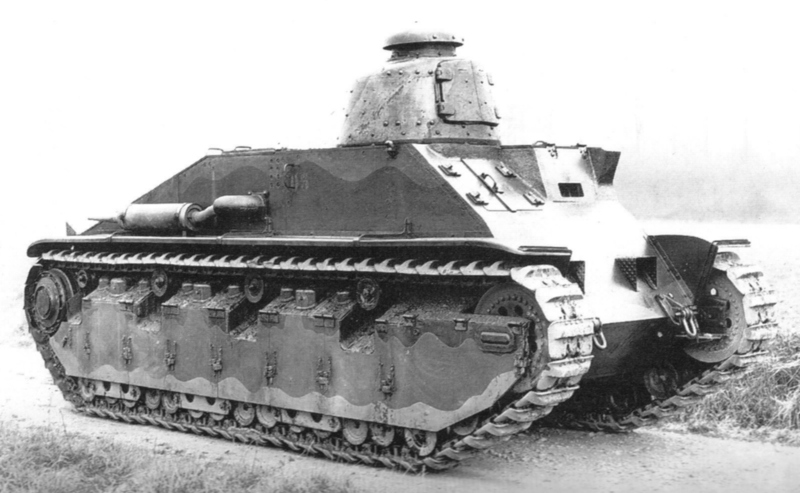 The first was the Renault UZ, with a riveted hull and Renault FT turret (April 1932). It was tested at Rueil with the 503e RCC and accepted in service in December 1933. One year earlier, two welded hull prototypes had been ordered and build, to be delivered in November 1933. Nevertheless, the first batch was approved without testing the real production model. This was done in order to partially finance the cost of applying new welding techniques. This building technique proposed by Renault saved weight and time. But it was a costly and complex process that Renault had a hard time to master at first, and, since production was rushed, problems immediately appeared. This was a compromise based on large flat screws, serving as bolts and rivets as well, the 40 mm (1.57 in) plates being partially welded and connected together. In most respects, the D2 was a slightly enlarged D1, retaining many features of the previous vehicle, like the vertical coil suspension design inherited from the Renault NC 27, and NC-1/NC-2 family. The D2 was still narrow, with the turret placed forward, immediately behind the driver’s compartment, and a long, sloped back engine hood. Massive side skirts with mud chutes, similar to the former vehicles, were also retained, composed of six panels. Previous experience dictated the return rollers to be placed higher to prevent track resonance. The tracks were 35 cm (13.78 in) wide. The suspension counted three bogies, each with four road wheels, one coil spring and two shock absorbers, per side. The crew was three, the radio operator being seated next to the driver, operating the hull Reibel machine-gun (low, right side). The commander was seated in the turret. As usual in this configuration, he had to operate the gun (loading, aiming and firing), serve the coaxial machine-gun and command the tank at the same time. There was a four-speed gearbox, and four fuel tanks, giving a 100 km (62 mi) range. The D2 could cross a 2.1 m (6.89 ft) wide trench, climb a 80 cm (2.62 ft) obstacle, climb slopes of 45° and ford 120 cm (3.94 ft) deep rivers. The first batch was approved on 29 December 1934 by the Commission de Vincennes, based on the new tests performed with the three prototypes, fitted with gasoline and diesel engines. The gasoline engine was retained. 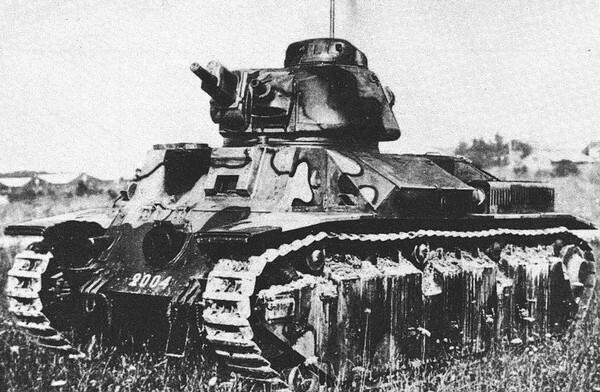 The turret was bought separately from another manufacturer, the Puteaux factory near Paris, and the APX-1 was chosen, a modern, cast turret fitted with a SA-34 short barrel 47 mm gun (1.85 in) (from the same manufacturer) and a coaxial Reibeil 7.5 mm (0.29 in) machine-gun, and a hemispheric observation cupola. As usual, the commander could sit partly outside on a rear turret hatch. The turret cost was 200,000 frs, which added to the hull (410,000 frs apiece) rose the whole D2 unit cost to 610,000 frs. The first units from the batch were delivered in May 1935, the last in February 1937. The SA-34 had limited antitank capabilities. It was supplied with HE shells (obus D, muzzle velocity of 490 m/s / 1607 ft/s), and AP shells (model 1932, muzzle velocity of 480 m/s / 1574 ft/s, piercing only 25 mm/0.98 in at 100 m/328 ft). Two command vehicles were built (chassis 2016 – 2049), equipped with a second ER51 long range set. The second batch was ordered later, in June 1938, (despite alarming tests reports reporting balance unreliability) following Renault’s assurance it could produce two hundred units a year. However, this was soon proved overoptimistic, in the political context of 1937-1938, plagued by general strikes and financial problems. The production was postponed, and there was uncertainty about possible exports to Poland or Belgium, eventually opposed by Supreme commander Maurice Gamelin, out of fear of technology transfers. The state of the first batch was so poor that their conversion into flame-thrower tanks was envisioned, while the unit tanks would be replaced by newer tanks. When the war broke out, Edouard Daladier confirmed mass production of the type, however deliveries were kept low, three-five vehicles per month, so that the entire second batch was not completed by June. The last fifteen were probably not taken in action in time. The second batch was basically identical, mostly differing by the use of a more modern APX-4 turret, bearing a 47 mm (1.85 in) SA-35 long barrel gun, quite effective against tanks. PPLR X 160 episcopes replaced the older Chrétien type, and there was a S 190 G attachment point on the roof for an extra 7.5 mm (0.29 in) AA machine gun. Improved greasing system, modified idler wheels and sprockets, ball bearings, shorter mudguards, a new Vertex distributor and Vlex starter completed this overhaul. 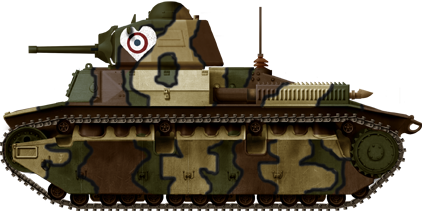 At the same time, older vehicles from the first batch received upgraded APX 1A turrets, and taken over at the Atelier de Rueil for rebuilding -namely to fix all the issues previously known. This process started in March 1940 and continued until May. At the same time, the flame-thrower project was maintained but never carried out despite a prototype being built in 1939. 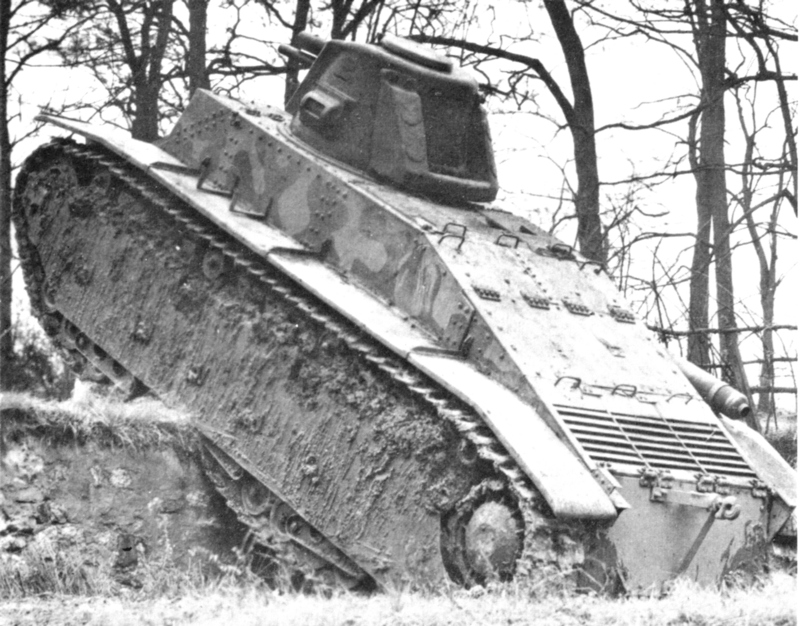 The bulk of the rebuilt D2 model 1935s were taken into the 19th BCC (Bataillon de Chars de Combat). Previously, the elite 507e RCC, then commanded by de Gaulle, received the first D2s in early 1937. By October, the unit’s organic strength was 45 tanks, the remainder being kept in reserve or for training (4 sections of three plus two command vehicles). De Gaulle, promoted to Colonel, heavily trained his crews to his cutting-edge tactics, but soon discovered that the model was plagued by mechanical unreliability and quickly worn-out, a problem further aggravated by the lack of spare parts. By September 1939, a waltz of unit names and affectations took place. Eventually De Gaulle was sent to command the reserve corp (GBC 517) of the 5th Army, and took part in the Saar offensive. These were then retired in reserve. Replacement by the second batch gradually took place, and 15 D2s of the new series were due to be sent in Norway. But this failed to materialize as soon as the model was proven ill-adapted to snow conditions. By the time of the Western campaign, the 19th BCC was a shadow of its former glory, reduced to a collection of worn-out vehicles, or partially rebuilt ones. However, this unit was committed together with the 345e CACC (4th DCR) under de Gaulle, into the hastily organized counter-attack at Montcornet on the 15th of May. After some readjustments, some tanks being cannibalized to keep others functional, the 345e CACC/19th BCC fought at Amiens on the 24th of May. 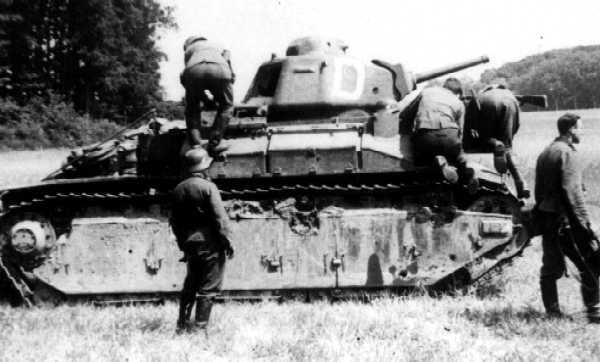 However, only 17 tanks were serviceable and without infantry support, the attack failed. The remainder were lost due to the complete lack of maintenance and incessant use. Of 84 effectively enlisted D2s, only 21 were lost due to enemy action during the campaign, 38 being abandoned after breakdowns, others were in depots, and only 7 were still operational when the armistice was signed. The Germans managed to captured 21 D2s, but none was placed back in service. The turrets were dismounted and reused in armored trains and fortifications. No D2 has survived to this day. Renault D2, early production (model 1935), testing a complex 8 tone pattern in 1937. This particular camouflage by unveiled by P.Danjou for Minitracks. 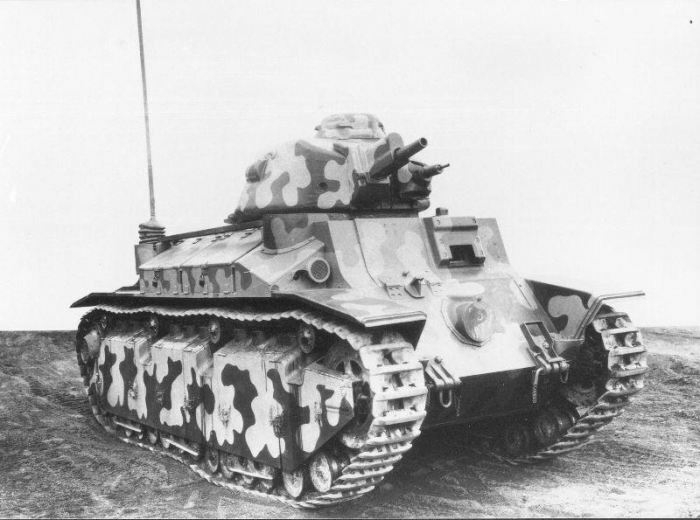 Renault D2, model 1935 (APX-1 turret), 3rd Company of the 19th BCC, May 1940. D2 model 1938, with the APX-4 turret and long-barreled 47 mm (1.85 in), which improved its offensive capabilities, 19 BCC, May 1940.Sources and more : Trackstory n°9, www.minitracks.fr, GBM.